A remodeled home reveals columns as the only separators between the kitchen and living room. If your home was built within the last decade, odds are it was designed with an open plan. The kitchen flows seamlessly into the family room, and few walls separate the living and dining areas. But what if your home is a bit older? In the 1970s and ’80s, “houses were built with a separate great room, separate small living room, separate small dining area” and a kitchen walled off from the rest, says Ellen Goode, professor of interior design at Meredith College in Raleigh, N.C. Phrases like “formal dining room” and “breakfast nook” were selling points. Today, many owners of those houses want the flexibility of an open plan, and are knocking down walls to get it. 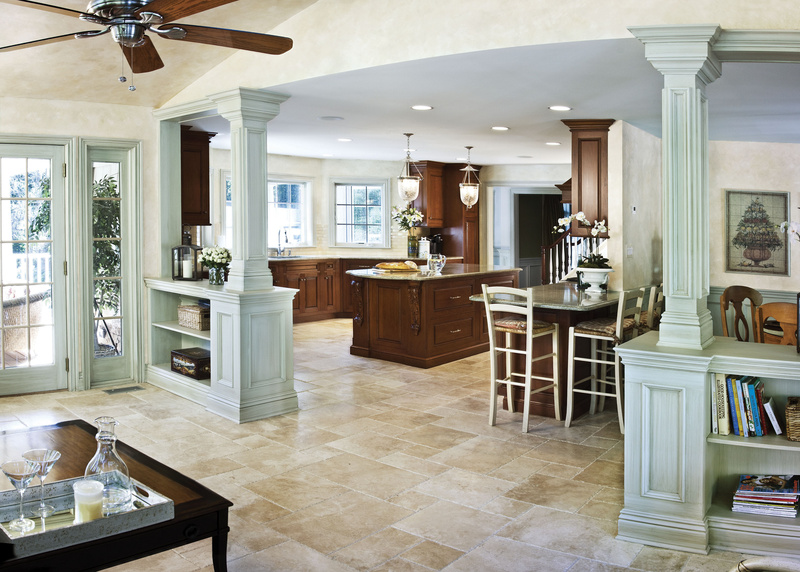 Kitchens are frequently merged with other rooms to create a larger, more inviting family area. Another reason why walls in older homes are coming down is because beds, sofas and other possessions are larger than they were a generation ago, says Dorcas Helfant, past president of the National Association of Realtors. Planning is vital, he says. And as potential DIY projects go, this one is best left to a professional. Demolishing a wall doesn’t have to be expensive or complicated, assuming nothing is hidden inside. But it’s likely there is some mix of electrical wiring, heating ducts, plumbing, even sewer and gas lines snaking through the wall’s interior. Those items will need to be rerouted. And new electrical outlets will need to be installed elsewhere, perhaps in the floor, to make up for any that are removed. Another potential cost: Walls originally built before 1978 probably have a base layer of lead paint. Even if they’ve been repainted since then, the removal must be done in compliance with safety guidelines. A certified remodeler can test for lead, Zuch says, and remove it properly. Most important, a load-bearing wall (which kitchen walls often are) will have to be replaced with architectural columns or some other type of support. So it’s wise to have the wall assessed by an expert before doing any demolition. In addition, there are costs that can’t be measured in dollars and cents. With a flowing floor plan, noise is harder to contain. If a child is doing homework at the kitchen table and needs quiet, Goode points out, you can’t close a door to keep out the sound of a television in the family room. And keeping pets and toddlers in one place becomes more difficult when you can’t simply close the kitchen door. From a design perspective, knocking down a wall brings opportunity and a few hurdles. But once a wall is down, “you don’t have Space A separated from Space B, so it all needs to work together,” he says. A kitchen and family room may both need to be redecorated if they’re now connected. Furniture can be used to delineate specific areas, but homeowners may not know how to accomplish that. “I see this all the time: I don’t know where to put my sofa, don’t know where to put my TV, because you’ve removed all your interior walls,” says Yip. Goode says partial-height walls or standing screens can help avoid a barn-like feeling and make areas more distinct. Helfant recommends consulting with an interior designer or home stager to plan the new space and determine whether an entire wall or just a portion should go. Depending on the cost, a designer may suggest including a column or two just to define the space, even if it isn’t necessary to support structural weight. When budgeting, Yip says, don’t forget things like new flooring, replastering the ceiling, new crown molding and baseboards. “It becomes much more than just, ‘I’m gonna swing my sledgehammer and take this wall out,’ ” he says.